Dunitz & Company: Real Beauty. Realistic Beauty. I'm all about Real Beauty! And perhaps that is better said as Realistic Beauty. 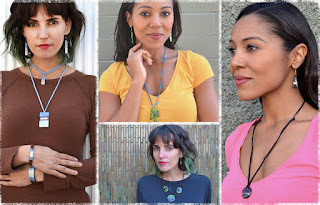 Dunitz & Company works diligently to create a fair trade jewelry line that is not only beautiful to look at, but will also allow women of all shapes and sizes to feel beautiful wearing it. Even better, our ethically sourced jewelry is good for heart & soul. I suppose this is why for years I've adored Dove's 'Real Beauty' Campaign. Back in the early 2000's a research study they commission revealed that only 2% of women considered themselves beautiful. Over many years, their campaign using models of varying ages, shapes and skin tones created an environment where so many women felt better about themselves. And that includes me. 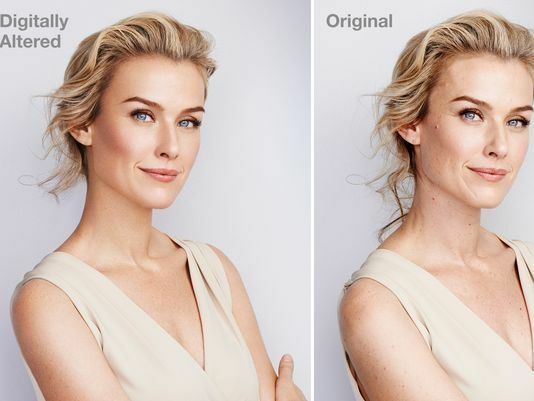 Today, CVS announced they will no longer use photo manipulation for their beauty products. And, they've also stated that if their suppliers, exampled by the such of Maybelline, L'Oreal and CoverGirl don't follow suit by 2020, CVS will mark their promotional materials with a symbol that allows customers to know they are 'digitally modified.' Now how cool is that? It's all about getting real. Of course the woman featured on the right here is gorgeous. She is gorgeous even when we see her pores. We might not look like her, but we can relate to her skin shown in the original photo. I love that financial giants such as Dove and CVS are celebrating the reality that most of us share. Last weekend I attended an opening for a stage show directed by a friend. The after party was attended by mostly young and what I considered quite attractive actors. I met one lovely comedienne and told her I'd love to see her perform and that she was adorable. She loved the compliment. And she also quipped that she was no Scarlet Johansson and when she went out on auditions, she was always told she was "interesting" looking. Huh? This was one pretty girl. And she was insecure about her looks. Did I say bravo to Dove and CVS for getting real? As most of you reading know, I hire models, actors and musicians to pose for me wearing Dunitz & Company fair trade jewelry. You can see many of them in our wholesale and retail LookBooks. In fact, last week I finished shooting Alexx and Rachel decked out in Spring 2018 designs. I confess. I've had women arrive to shoots in the past with cold sores and major break-outs. I've always cleaned up significant imperfections in Photoshop. I don't think anyone would ever accuse my shots of being so touched up that our models aren't real. (I'm afraid I don't have the skills to do that anyways.) Dunitz & Company is about real and realistic.